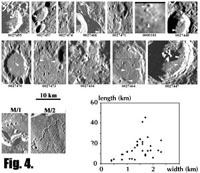 Database of lunar-like rilles on Mercury, Kereszturi A., 2002., LPSC XXXIII. 1663. Introduction: In our previuos work we searched fo lunar-like rilles on Mercury  and found about 60-90 possible sinuous rilles on the images of the first encounter of the Mariner-10. This abstract is about an increasing database on the found rilles on Mercury. The sinuous lunar rilles (rimae or channels) were carved by thermal erosion of lava flows and/or subsequent collapse of lava tubes on the mare basalt terrains of the Moon [2,3]. Because of the several similarity between the evolution of the Moon and Mercury there is reason to analyse channels on Mercury too . Working method: In the first phase of the database making processed images  were surveyed with visual method looking for possible sinuous rilles (channels). The images were made by the Mariner-10 during its first encounter with 0,2-2 km resolution. The visual searching is somewhat subjective but up to date no better method is known. (In the future we are planning to use some kind of shadow based image processing with different filter orientations to search for possible connection between the tectonic pattern and the orientation of rilles.) After the survey of the images any possible sinuous rill was analysed only on the best images among the several ones were made of the same area during the flyby. Because of the slow rotation of Mercury no changes were visible during the flyby on the images of the small sinuous rilles. We classified one structure as a possible channel if it satisfies the following criterions: 1. both of the Sun illuminated and shadowed side is visible. 2. based on the lighting condition it is a negative relief structure. 3. it does not has exact straight alignment. 4. it does not cut across terrains with highly undulating relief. (One can expect lava flows only to lower terrains and not upstream. Of course it is difficult to estimate the exact surface topography on the images. ), 5. it does not align with obvious tectonic structures (estimated by the surrounding tectonic pattern. ), 6. the structure does not appear to be connected craters (it was difficult to determine in several cases). General tendencies: There were many problematic cases in the identification, mostly with crater chains , chain like structures, connected depressions; possible tectonic originated nearly straight fault-like structures and low relief fold-like structures which are very frequent too (Fig. 1. is for the difficulties of the identification, there are channels namely sinuous rilles), uncertain channels and tectonic structures too.). The Caloris-basin has many rill-like structures. They are not included here, and will be part of a different future work. 56% of the already analised rilles started from somewhat crater-like depressions. There are great number of channel-like structures on the ejecta blanket of greater craters too, mostly originated from small craters or depressions. In this case the flow direction is nearly parallel with the direction of the ejecta fall-out. On Fig. 2. are some examples for this on the blanket of the crater Zola (the overview of the terrain is on the left, some magnified example is on the right). On Fig 3. another example is visible: the left "straight" structure can be secondary crater chain or tectonic structure too, the right "meandering" channel has possible other origin. Because the great problems of the identification this database can't be considered as a closed work but it is a helpful base for the analysis of landforms on Mercury. The database is available on the Worl Wide Web with the images of the analysed rilles at. Conclusions: 1. During the survey 60-90 possible sinuous rilles (channels) and another 50-100 uncertain cases were found on the images of the first encounter of Mariner-10. 2. Greater part of them were on smooth plains and on smooth crater infill plains. See some more examples for on Fig. 4. in the upper two rows. 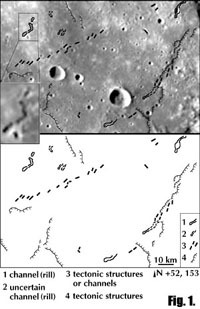 The two bottom image shows two lunar rilles on the same scale for comparison (M/1: part of Schröter's Valley, M/2: a rill between the craters Delisle and Diophantus). 3. It is difficult to follow them farther than 10-20 times of their width's. 4. Many sinuous rilles are connected to crater like or elongated pits, some connected to several pits. 5. There are areas where the rill density is 2-3 times higher than the average. 6. Based on ther starting point we can devide them into crater and not crater originated sinuous rilless. Rilles which originate from a crater the daytime hot mercurian environment possible take part in keep of the impact melts in fluid phase. 7. Some sinuous rilles average width/length ratio is visible on Fig. 4. (That sinuous rilles which originate from a crater the width of the crater was excluded and the width was measured farther out in the "normal" part if the relles. Several cases the rilles can be longer than the measured value. The measurements can be considered only as a statistical approach, below 2 km the uncertainty is around 50%, somewhere higher, between 2-4 km around 30%.) In spite of the relative great number of the found channel-like structures many of them can't be taken for certain that it is a sinuosing lava channel. Base on these results the rills on Mercury will be good subject to analyze the volcanic activity and behaviour of lavas. Future work: During the survey we met with many interesting features, like domes, crater chains some mass movements etc. After the analysis all of the Mariner-10 images we will be able to summarize the necessary observing methods and would like to develop a more accurate GIS based system for the measurements of the channels, and an automatized software to identify small cone like structures. Kereszturi A. (2001) Workshop on Mercury #8051. Carr M. H. (1974). Icarus 22/1-23. Martha An Leake The intercrater plains of Mercury and the Moon, Advances in Planetary Geology, NASA TM-84894., 1-537. Planetary Data System, United States Geological Survey. Schevchenko V. V., Skobeleva T. P. (2001) LPSC32th #1510.